Komodo island day tours from Bali is designed in private trip to Komodo National Park. The minimum participant is 2 person and it is guarantee depart every day. This tour also is a great opportunity to see the Komodo dragon and explore the islands around the park. It is suitable if you have only a short time on your holiday, but you don't wanna miss out to visit the Komodo National Park. 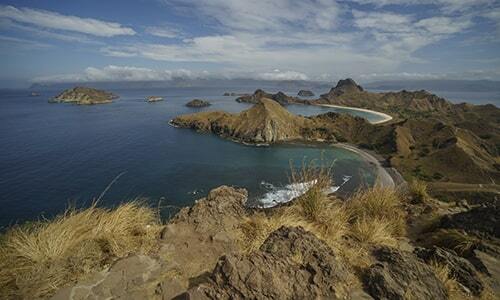 There are plenty of places to visit, such as Pink Beach, Komodo Island, Padar island, and Manta Point. Each of these places is offering the amazing activities to do. Landscape, Komodo Dragon, and beaches are the most dominant attraction of the islands that offer to you. How to do a Komodo island day tours from Bali? Book a return flight in the morning about 07.30 AM from Denpasar Airport-Bali on the same day. The flight will take you there approximately 1 1/2 hours. Book a tour to Komodo island from Bali using the search box in the home page. Stay relax, our team will handle over you the Airport pick up and speedboat transfers from Labuan Bajo to Komodo National Park. Most day tours to Komodo are inclusive with the lunch box and mineral water on the boat. We also provide snorkeling gears and pictures documentation. The last flight from Labuan Bajo to Denpasar-Bali is around 16.00-16.25. So you may book this schedule if you want to get back to Bali on the same day. Komodo National Park mostly consists of hilly islands, savanna and some beaches that you can visit. When you get to Komodo island, the first thing you will do is registration at the Komodo National Park office. You will have a briefing by the ranger about the island and many things.